4H vs. 4L: Why is There More than One 4WD Setting? People will sometimes come into Land Rover Fox Valley, look at a new vehicle and ask whether it comes with multiple four-wheel drive settings. 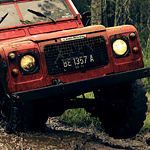 If you've never used 4WD very often, then you might be wondering why anyone would need more than one option. Four-low or 4L drive is what you probably think of when you think of shifting into all-wheel drive. It's designed for maximum traction and power, which makes your wheels turn more slowly. You can use it to ascend a steep incline or climb rocks. You generally don't need it for driving in downtown Appleton, however. The four-high or 4H setting isn't as extreme. It gives you a bit of additional traction without cutting into your top speed nearly as much. While it still does use more fuel than normal two-wheel drive, the 4H setting is good for dealing with slippery roads and other sketchy conditions.